At Mac and Wild they’re doing brunch like you’ve never seen before. Already a well established burger restaurant, Mac and Wild is branching out into boozy breakfasts just a short stroll from Oxford Street! Scroll down to find out what I thought about the brunch menu when I was invited to give it a try! I love to get caught up in the launch of a new restaurant, with soft launches, press parties and endless social media hype, but somehow the opening and Mac and Wild completely passed me by ! 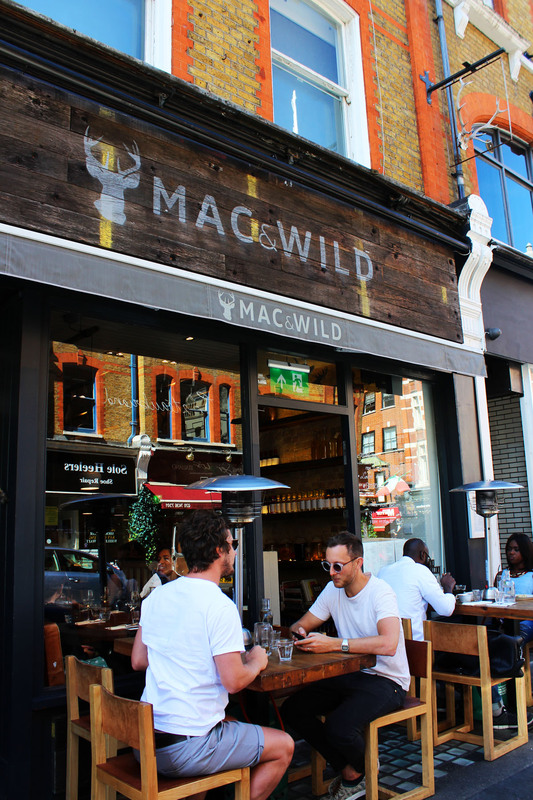 Mac and Wild actually started back in 2010 as venison-based street food residence The Wild Game Co in various markets and pubs across the capital before they finally opened a pop-up in 2014. I remember the hype well and it was so popular that the permanent restaurant Mac and Wild was born! As with The Wild Game Co, Mac and Wild is most famous for specialising in Scottish venison. In fact, rumour has it that most of the meat comes from co-owner Andy Waugh’s father’s estate. They’ve absolutely nailed their venison burger – which has won awards – but now they are branching out into Scottish themed boozy brunches. Applying the same principles of quality over quantity they have created a short but sweet brunch menu that showcases the best of Scottish produce. Every Saturday and Sunday between 11am and 4pm, Mac and Wild open their doors to brunch lovers. Whether you’re after traditional brunch fare like avocado on toast or something distinctly Scottish they’ve got you covered. It’s not a huge restaurant – instead I’d describe it as warm and cosy! Split over two levels its long and thin and gets busy quite quickly , particularly after 1pm. That being said, Andy and his team will be happy to squeeze you in and even when it’s busy the restaurant is totally chilled out with a really laid back vibe. The staff are really friendly with the perfect balance of being attentive (making sure your glass is topped up) and hands off giving you space to natter. I mentioned pretty early on in this review that Mac and Wild offer bottomless bloody Marys for £14.50. (I imagine a lot of you will have gone and booked a table for that reason alone and I wouldn’t blame you! 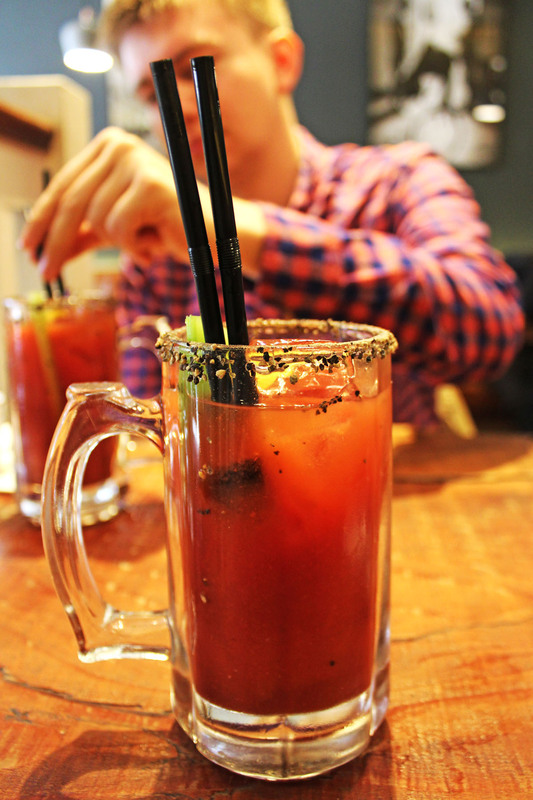 After all, a brunch wouldn’t be a brunch without a bloody Mary would it?!) But what I love about Mac and Wild is that they’ve taken this essential brunch component and put their Scottish spin on it. On the brunch menu you have two choices: the bloody Scotsman made with Bruichladdic Port Charlotte, tomato juice and Mac and Wild’s secret spice blend; or the bloody botanist made in the same was as the bloody Scotsman but with Botanist gin. Jon opted for the Scotsman and I went for the Botanist! Both slipped down incredibly easily with the Scotsman having a bit more bite and smokiness, the botanist being a much lighter drink (which made it all the more deadly!) If you only get the one drink it will set you back £8 but considering the size of these tankards that’s pretty good value! 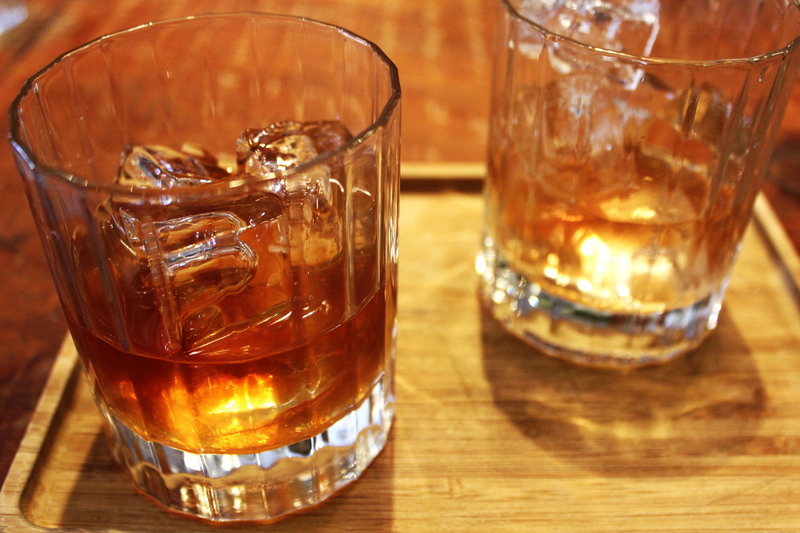 I’d definitely recommend starting with one of these while you peruse the menu! After polishing off the bloody Marys we tried one of the other cocktails on the brunch menu, Tams Tears, made with prosecco, Tanquery Ten, dry vermouth, lemon verbena and Fino sherry. I swear this cocktail was made for me – it’s all of my favourite drinks in one! This was another light and zingy cocktail which went well with the rather rich and heavy plate of food I was working my way through. It’s the perfect alternative for anyone not so keen on tomato juice! As we filled up on Scottish fare we also made our way through two other cocktails: the Forager and the Ginger Laddie. The Forager is a really clever, distinctive cocktail which captures the essence of Scotland. Made with Auchentoshan triple distilled Lowland whisky, foraged pine leaf tincure (which gives it it’s name) double infused heather honey and barrel aged bitters it is a really smooth, smoky cocktail with lots of depth. Once you’ve made a start on the drinks list you’ll probably want some food – after all that’s what Mac and Wild are actually famous for. If you’re after something distinctively Scottish then you might want to opt for the Scottish Breakfast, the Scooby Snack or maybe the kedgeree or maybe even the pine cured salmon. Being the glutton that I am, I went for the full on Scottish Breakfast made with home cured bacon, home made tatty scone, white pudding, mushrooms, black pudding and Lorne Sausage. 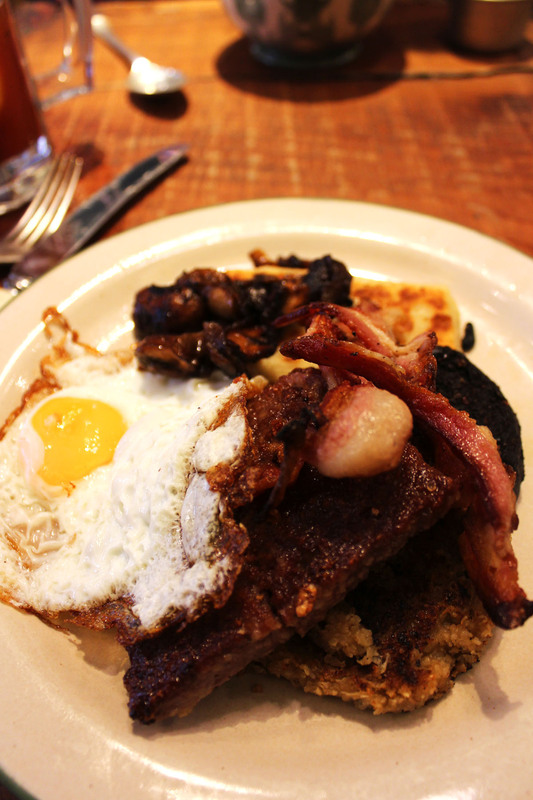 As with all of the food at Mac and Wild the ingredients for the Scottish breakfast sourced from some of the best producers in Scotland! 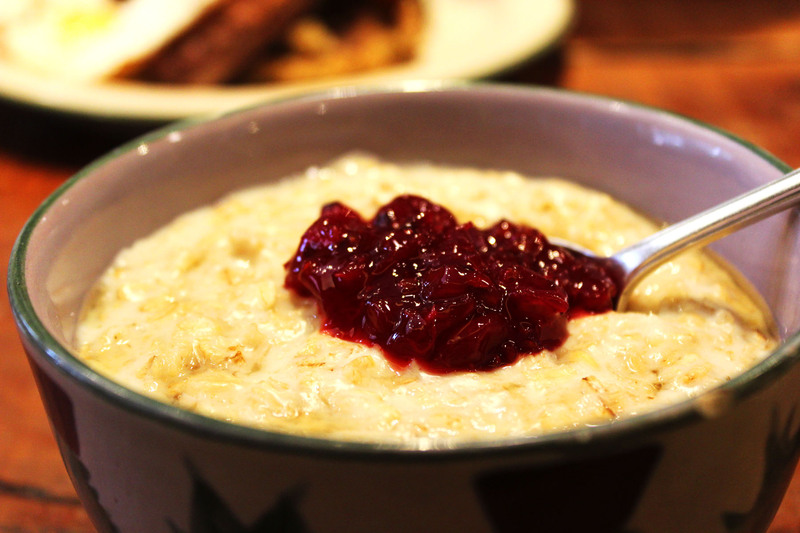 If you’re after something a little more virtuous, or a veggie option like Jon, then you have to have the porridge. Now I know what you’re thinking, why would you go out for porridge when you can easily make it at home? But this is porridge like you’ve never tasted before!!! This classic dish is pimped out with blueberry compote, candied walnuts and heather honey. It just goes to show just what a difference it makes using high quality ingredients! Jon had been a little nervous by the fact that there veggie options were quite limited but actually we both adored the porridge and would happily go back just for that one dish! If that’s not a good endorsement I don’t know what is! After our brunch we did attempt to walk off a few calories on Oxford Street. The restaurant is in an ideal location for anyone looking to do a spot of shopping post-brunch! We were so full of food and drink that we soon decided to call it a day and snoozed all the way home on the tube! Think the Wild Brunch sounds pretty damn awesome? Then check out the Mac and Wild website and book yourself a table! Trust me, you won’t be disappointed! That looks like my kind of place! 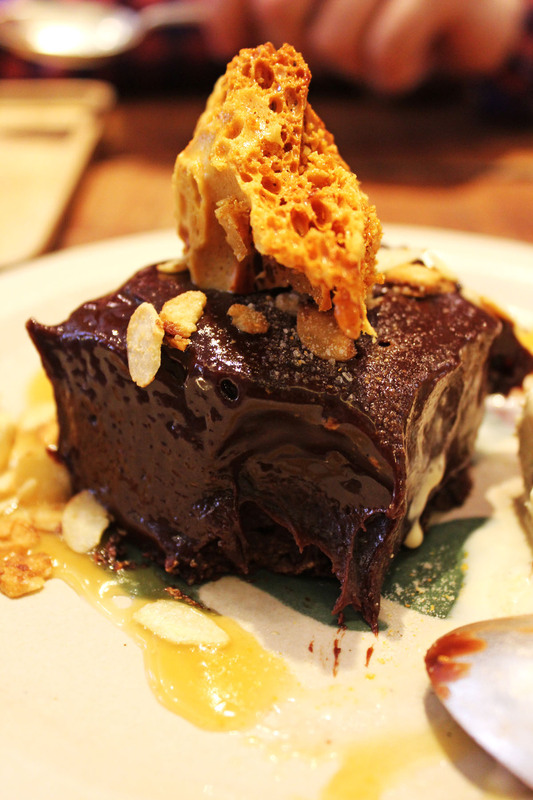 I love finding a new brunch spot (it’s my favourite meal) and that chocolate dessert just looks epic. Sounds like an epic brunch! Some of those cocktails sounds right up my street, although DH would be annoyed if anyone tried to mix things with his whisky! It was so so good Nadia. Can’t recommend it enough. Will definitely be trying to replicate it at home!